Skeels had a big offensive weekend against South Alabama University tallying 6 RBI and 2 HR. 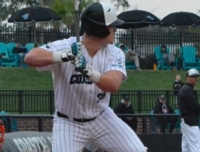 The redshirt junior’s offense propelled the #24 ranked Chanticleers to win the series over the Jaguars to bring his BA to .324. Skeels has also been named to the Buster Posey Award watch list that goes to the best catcher in the country. The junior catcher helped St. John’s cap off their weekend with a win against Butler to clinch the series. Henshaw had 3 hits and 2 RBI in the three game matchup and scored the extra inning game winner against the Bulldogs to give the Red Storm their 11th (out of their last 12) Big East win. Grabek returned to Connors Park, the home of the Dutchmen, to pitch against Siena this weekend. The sophomore recorded the save in Fairfield’s 4-2 victory over the Saints and lowered his season ERA to 1.69. The junior outfielder collected 4 RBI and 4 hits when the Sailfish routed the Bucs of Barry University this weekend. Seltzer is now batting .333 on the season with 47 hits and 30 RBI. Dunn had a big offensive and defensive weekend for the #22 ranked Cardinals against #19 Clemson. The sophomore had 3 hits in 6 AB to bring his season BA to .364. Defensively he also got it done by making a catch in the bottom of the second to rob the Tigers of a huge extra base hit.